That night some shepherds were in the fields outside the village, guarding their flocks of sheep. The stars in the & particularly the bright one over the cave near Bethlehem provides the cool blue light of this scene. In contrast to that is the warm yellow/red glow of the shepherd’s camp fire. You can see highlights of that warm glow on the figures, sheep, trees & surrounding ground. I am very pleased with the way this scene has come out. 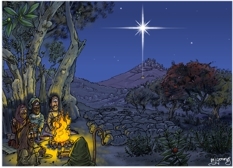 The warm fire glow which illuminates the shepherds & their sheep, contrasts wonderfully with the cool blue white star light. 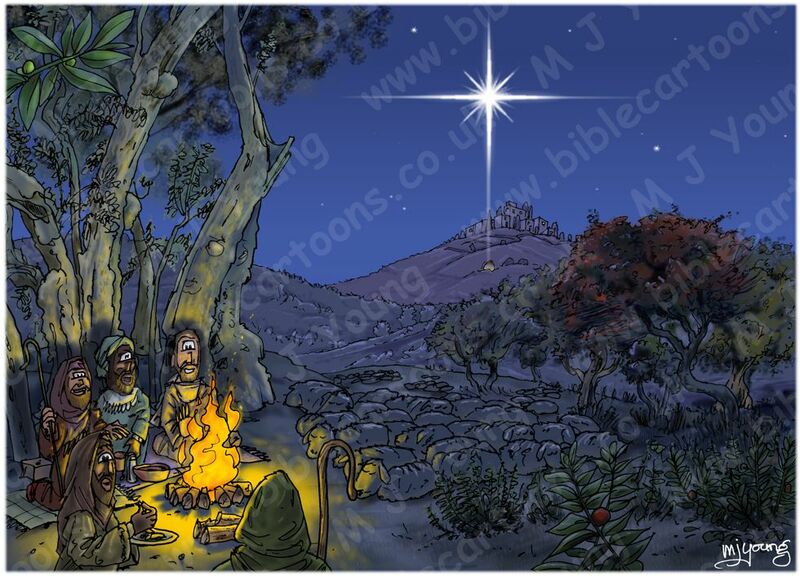 I looked for photographs of a suitable view of Bethlehem on the internet for this scene. The photo I found shows the modern city, which is indeed built on a hill. My version of Bethlehem is as a large village or small town, since I believe there were far fewer people living in the place in first century Palestine/Israel than there are now. The reddish tree on the right is Terebinth (aka Terpentine tree) (Pistacia terebinthus). thought to be 5,000 years old. That makes it 3,000 years old at the time of the scene above! The bush with red berries in the foreground is Butchers’ broom (Ruscus aculeatus).